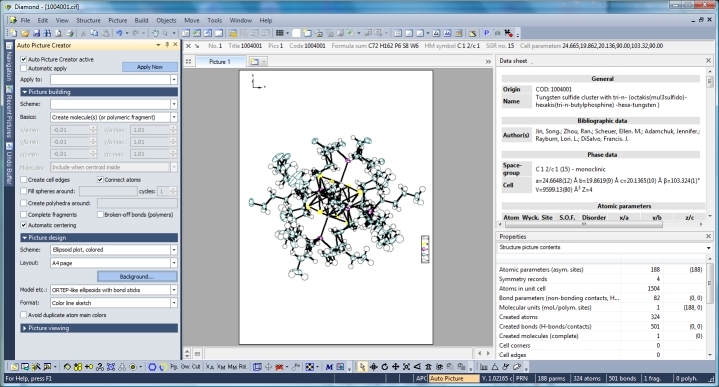 Make your structure picture settings (a rendered colorful screen plot or an ORTEP-like ellipsoid sketch on white paper) along with the designs of atom (groups, sites), bonds, polyhedra, etc. -- and simply call "Create Design Scheme" to create a design scheme from these current picture settings and save it under a title, so you can access this scheme whenever you later want to quickly re-design a picture from another structure. The following example shows how to quickly re-design a rendered color picture to a flat color-line ellipsoid sketch on a white A4 page. 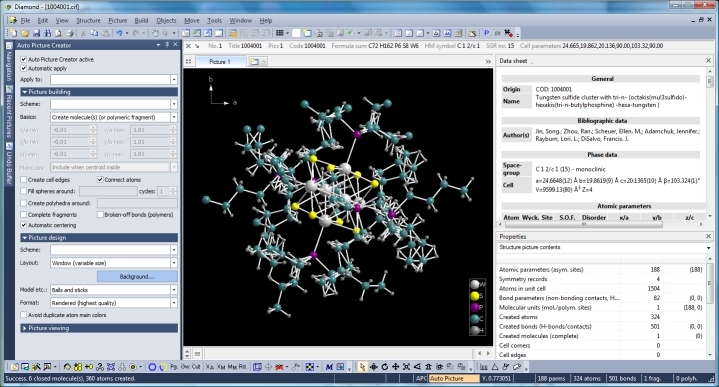 After loading "1004001.cif" (which is Crystallography Open Database (COD) entry #1004001, Tungsten sulfide cluster with tri-n- (octakis(mu!3sulfido)-hexakis(tri-n-butylphosphine) -hexa-tungsten) by Jin, Song. ; Zhou, Ran. ; Scheuer, Ellen. M.; Adamchuk, Jennifer. ; Rayburn, Lori. L.; DiSalvo, Francis. J.). The default or current setting is "window layout", "ball-and-stick model" and "rendered". When using the "Auto Picture Creator", the simplest way is to choose the design scheme from the "Scheme" combobox in the "Picture design" section of the Auto Picture Creator. Other ways -- if you prefer manual changes at your structure picture -- is to choose the appropriate design scheme from the "Design Schemes" sub-menu in the "Picture" menu. When running "Apply Design Scheme" from a "Design Scheme" dialog, you have additional choices which fields of the scheme to apply, e.g. just the atom and bond desings but leaving rendering options and background color settings unchanged. (1) Make your preferred picture design settings manually by using several commands from the "Picture" menu, typically "Model", "Atom Designs", "Picture Settings", etc. 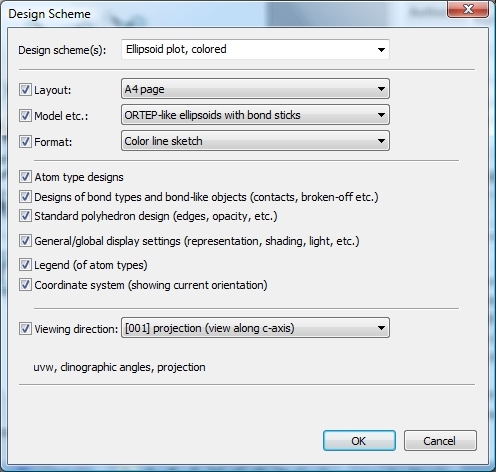 Then run "Create Design Scheme" from the "Design Schemes" sub-menu of the "Picture" menu. In the dialog (see example above), you may choose which fields of the scheme to be relevant. (In the above example: all fields including picture viewing settings.) Give your scheme a title and save it. (2) Use the "Auto Picture Creator" to approach your preferred design by changing settings for "Layout", "Model etc. ", and "Format" in the "Picture design" category, and then run "Create Design Scheme" dialog like described under (1). The Design Scheme Manage allows you to maintain, add, edit or delete design schemes whereever later.